Bookeye® 4 V2 Semiautomatic overhead book scanner and book copier is suitable for digitization projects that require high quality and maximum productivity even in 24/7 operation. Originals up to A2+ in size such as books, magazines, posters, folders or bound documents of all types, can be digitized at high speed and a maximum resolution of 600 dpi using Bookeye® 4 V2 Semiautomatic. The unique self-adjusting book cradle solution allows scanning either at a 120 degree angle or in flat mode. 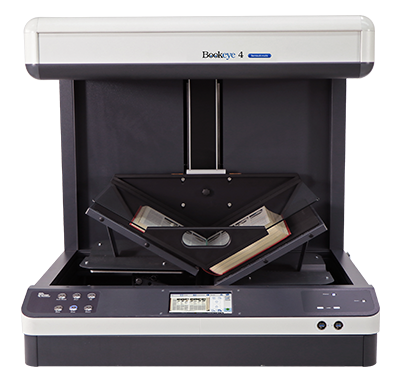 The motor driven V-shaped book cradle enables distortion free scans while it also protects the book binding. The balanced design allows effortless scanning without any physical effort. Image Access has four powerful software packages in its portfolio for Bookeye® 4 V2 Semiautomatic which enable optimal capture for large projects. 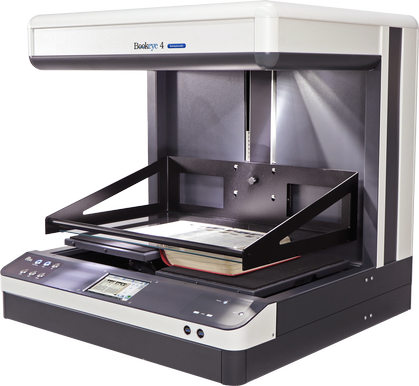 Batch Scan Wizard, BCS-2 and Goobi UCC are designed to compliment the Bookeye® 4 Semiautomatic and can meet any requirement within a digitization project. Furthermore, the Bookeye® 4 Semiautomatic can also be used via the optional TWAIN driver interfacing with third party applications.